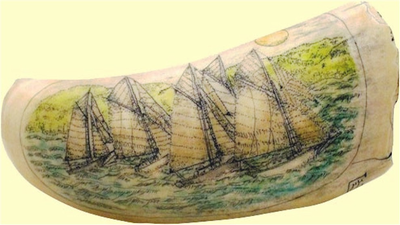 Home»Gallery of Legal and Registered Scrimshaw Whale's Teeth and Walrus Tusks»Gallery Display ScrimshawSperm Whale Tooth"Friendship Sloop Regatta"
The Friendship Sloop is the most graceful of all the gaff-rigged sloops. Her beautiful lines were developed from the lobstering, handlining and swordfishing boats of Muscongus Bay in Maine. This lovely horizontal tooth is polished only on the front side so that the viewer can feel the natural state of the tooth. On the front is a delicate and meticulous etching of five Friendship Sloops in a regatta. The wind is off the starboard bow and three of the sloops have bunched up, while the fourth has eased his sheets and caught a puff. A fifth, laggard sloop brings up the rear. This tooth weighs 164 grams and is 5 1/4 inches around the curve. It is done in the stippled technique and is colored with a very light wash. This is, of course, a legal Sperm Whale's tooth, registered with the Department of Commerce. As all of our teeth do, it comes with a Certificate of registration. Includes a round wooden stand. Or choose, as an added option, a handcrafted sterling silver stand made expressly for this tooth. A unique piece by scrimshander Marvin M. Cohen - Only one available.